A Russian Proton rocket blasts of from Baikonur Cosmodrome in Kazakhstan carrying the Russian Express AM44 and MD1 communications satellites. A Proton rocket blasted offfrom a snow-covered launch pad early Wednesday with a pair of Russian civilcommunications satellites, beginning a lengthy 9-hour mission to put thespacecraft on track to their new home 22,300 miles above Earth. The Proton booster ignitedits six first stage engines and roared skyward at 0003 GMT (though it was 7:03 p.m. Tuesday night EST) from Complex 200 at the Baikonur Cosmodrome in Kazakhstan. Liftoffoccurred in the predawn hours at the launch site. The rocket?s three corestages powered the launcher into space within the first 10 minutes of themission, leaving the Breeze M upper stage to complete a series of burns toplace the Express AM44 and Express MD1 satellites into the targeted orbit. The Breeze M upper stage isscheduled to release Express AM44 at about 0915 GMT. Deployment of Express MD1should occur about 15 minutes later, according to the Russian space agency. Express AM44 was built byReshetnev Co., a Russian aerospace company formerly known as NPO PM.Khrunichev, the Russian firm that also builds Proton rockets, manufacturedExpress MD1. Thales Alenia Spaceprovided the communications payloads for both satellites, which will beoperated by the Russian Satellite Communications Co. for government andcommercial users. Express AM44, weighing5,582 pounds at launch, will use its own propulsion system to park itself ingeostationary orbit along the equator at 11 degrees west longitude. The craft will eventuallyreplace the aging Express A3 satellite at that orbital location, which servescustomers across Russia, former Soviet states, Europe, Asia and Africa. The satellite carries acommunications payload of 16 Ku-band, 10 C-band and a single L-bandtransponder. The gear is designed to provide digital television and radiobroadcasting, data networking, videoconferencing and Internet services for atleast 12 years. Express MD1 is the firstmember of a new series of smaller communications satellites to be launched forRSCC. The 2,513-pound satellite will be positioned in geostationary orbit at 80degrees east longitude. The satellite?s eightC-band and one L-band transponder will provide secure communications for seniorgovernment leaders in western Russia. RSCC also plans to launchthe identical Express MD2 satellite, but the company has not released a launchdate for that mission. The company is alsodeveloping Express AM4, a massive high-powered satellite built by EADS Astrium.That launch is scheduled for late 2010. 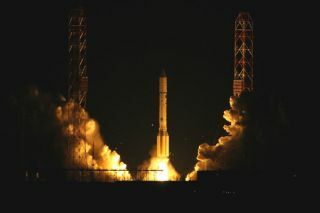 The next Proton missioncould occur later this month with a Russian military communications satellite.